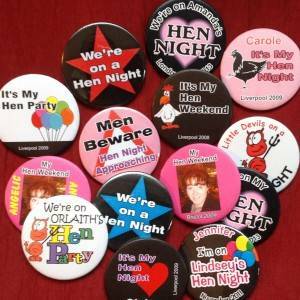 Our hen night personalised badges remain one of our most popular and most versatile of the products that we have in our range of hen party wear and birthday party items. They can be used on their own as simple button badges, where we have 3 different sizes of circular badges 45mm, 57mm or 75mm – and rectangular badges( 40 x 60mm) and heart shaped badges (approx 45mm at the widest point). Personalised Rosettes If you want to enhance the badge a little then any of the circular badge designs can be made into a rosette. Further information on our rosette options are on our rosette page. If you don’t want to use a pin to attach the badge to clothing or you want to use the badge as an identification disk then we can supply the larger 75mm badge with a ribbon. The badges can then be worn like a medal around the neck. The ribbon is supplied with a safety breakaway connector. As an optional extra you can also have the ribbon custom printed. 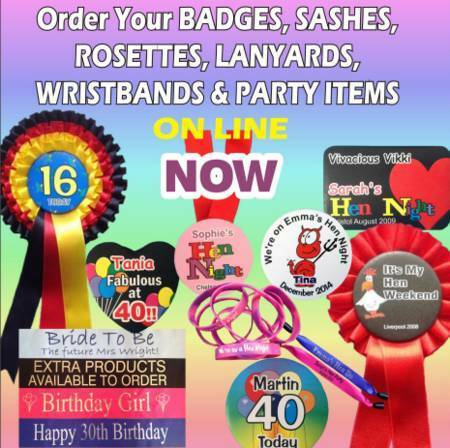 The badges that we have on the web site are just to give you some idea of the types of designs that are possible. And of course it gives you the best idea of what the badges will look like. As well as speeding up the ordering process. You can use these personalised badge templates and change the wording, colours etc to suit your particular event or event theme. 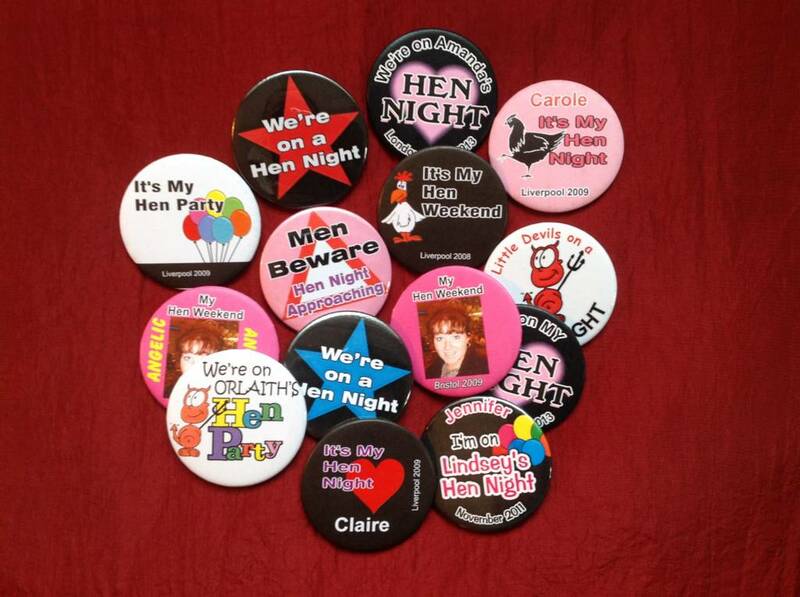 We have various themed badges and to make it easier for you to make your choice. We have grouped them in to different groups on the menu, such as those that have hen or chicken images, or hearts or angels etc. It doesn't make any difference how many words you have on the badge, The only small extra charge is when you have individual names on each of the badges. If you wish to put a photograph on your personalised badges then this is quite easy. All you need to do is select a good quality photograph. We can clean it up and remove any extra people from the shot. Just ensure that you tell us which is the person to use. You will be shown an upload link when you check out. If you wish you can also order a separate personalised badge for the Bride. So instead of the badge saying we are on Sarah's Hen Night it would say I'm on my Hen Night, with the word Sarah underneath. Another way to make the Bride stand out from the rest of the party goers is to make the badge for the Bride a little bigger than the others. For example you could order everyone else a 57mm badge and then get the Bride a 75mm badge. And possibly change the colour of the background. Alternatively you could opt to make the badge for the Bride into a rosette. Further details of the rosette options are shown on our rosette page. If you cannot manage to order exactly what you require on line. Then you can always send us an email with your request. Or just fill in our enquiry form. We will then send you a quotation. When you are ready to order we can send you a payment link. Personalised Badges next day is always a possibility with us.